The report details a two-year exploratory, mixed-methods research study on the disciplinary practices and climate of schools serving K–8 students in the School District of Philadelphia (SDP). Findings reveal that SDP schools are making efforts to reduce suspensions and improve climate, but critical barriers to these efforts include resource limitations and philosophical misalignments between teachers and school leaders. The study identified three profiles among SDP schools serving K–8 students based on information about disciplinary practices and climate, and found that these profiles are predictive of suspension and academic outcomes. Students attending schools with collaborative climates and less punitive approaches to discipline have lower risk of being suspended and better academic outcomes. The report offers a series of recommendations for strengthening the implementation of climate initiatives, including Positive Behavioral Interventions and Supports (PBIS), in challenging urban settings. Abigail Gray; Philip Sirinides; Ryan Fink; Adrianne Flack; Tesla Dubois; Katrina Morrison; and Kirsten Hill (2018). 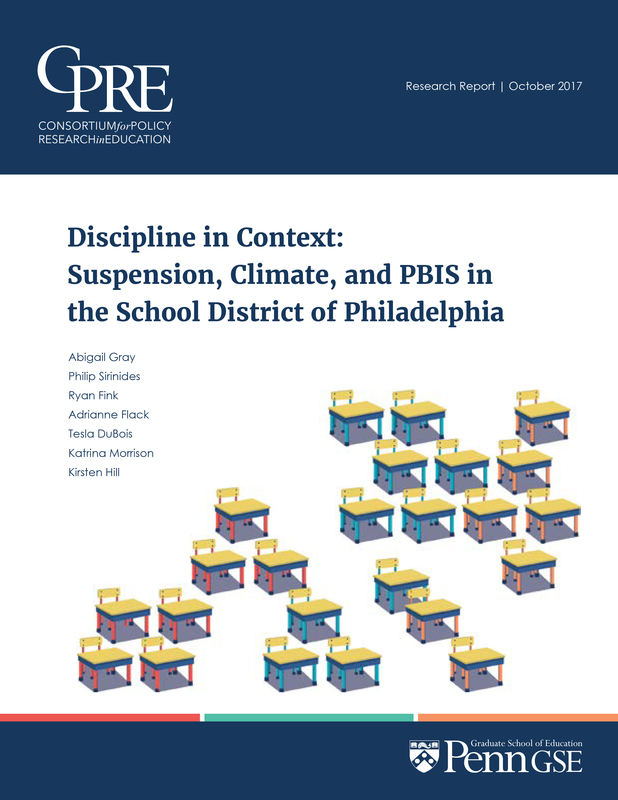 Discipline in Context: Suspension, Climate, and PBIS in the School District of Philadelphia. CPRE Research Reports.